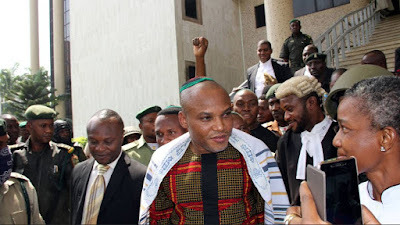 Nnamdi Kanu Rejects Presidency, Affirms The Feasibility Of Biafra Republic! Nnamdi Kanu, the embattled leader of the Pro-Biafran group, Indigenous People of Biafra, IPOB, has reacted to popular opinion that he intends to become the president of the Republic of Biafra if the dream is actualized. Mr. Kanu who was recently released on bail while speaking with Vanguard noted that he has always preferred to work in the background adding that if the pioneer leader of the Movement for the Actualization of the Sovereign State of Biafra, MASSOB, Chief Ralph Uwazurike had remained consistent and true to the struggle for Biafra, he would not have been in the forefront of the movement. The embattled IPOB leader who insisted that the actualization of a Republic of Biafra was a foregone conclusion noted that he understands the stand of some South East governors and other political office holders’ on issues relating to IPOB and Biafra. He further noted, “I am into this struggle because of leadership vacuum. I am into this struggle because my people are suffering; they are being denied their rights and privileges and nothing will stop this fight. I want to assure our people that we are almost there. “The Biafra Republic is almost here with us. Even if one is from Sokoto, he can be a Biafran once he believes in our value system of equity, justice, and fairness.